The Xeno threat, after facing defeat at last year’s Yearhammer battle, blames their losses on their alliance with the forces of Chaos. To get their revenge, the Eldar, Tau and Necron forces teamed up looking to eradicate the systems of all forces of mankind, no matter if they worshiped the corpse God or those hiding out in the Warp. Command Points: 20 PL for each team. No abilities were allowed to regen or earn free CP. Painted Re-roll: Our house rule for fully painted forces would still be in effect. Since this entire game featured fully painted models, each team received 1 Painted Re-roll, which allowed them to re-roll ANY dice once in the game (including that of their opponents). Zero unpainted models were allowed in this game. Psychic Phase: We decided to use the Matched Play approach to this phase. With the exception of Thousand Sons and Grey Knights, all Smites would increase by 1 to cast. Abilities could only be cast once per psychic turn, unless the team wished to spend 1CP to cast again. Shooting into Close Combat: Since this was an all out war, teams could decide to shoot into a Close Combat phase, if they were not apart of that phase (ie: if there is a battle between the forces of Imperium and Chaos, the Xeno team could shoot into it during their shooting phase). For every successful hit roll, the dice would be rolled again. On a 3+, that hit would target the unit with the most wounds in that combat. Wound rolls would then be rolled as normal. Only one named character was allowed per team. Each team would have one warlord, which would be used for scoring. Since we weren’t using traditional detachments this game, each team could have 1 free Relic. Additional relics would cost 1 CP each. For Team Chaos, any summoned daemons had to be paid for in their main 500PL list already. Players: Alejandro, Leo, Max, Oscar and Tim G.
To start, each team draws randomly a dual deployment zone (teams roll a dice, highest can chose first, etc). 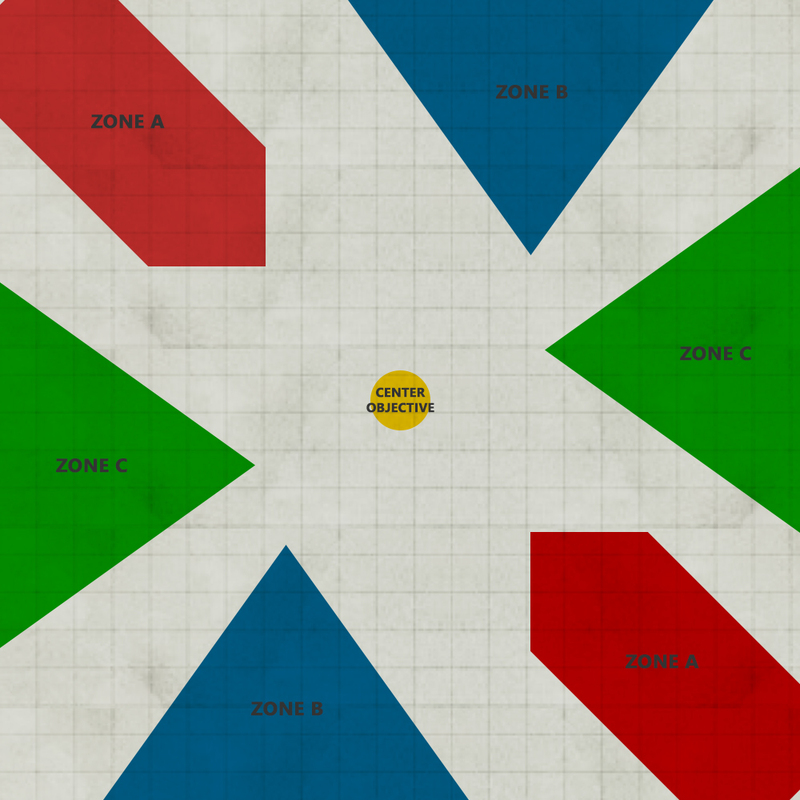 Zones A, Zones B or Zones C. Once the zones were chosen, all three teams deployed simultaneously and lasts 30 minutes. Once a model was placed on the board, there was no moving it (even if an enemy puts something nasty in the zone next to them). If units are not deployed at the end of the 30 minutes, they are automatically placed in reserves. Turn Two – anything with the Vehicle keyword could arrive, as well as remaining units with the keywords from Turn one. Turn Three – Anything else! This is where we decided to try something new. We knew the team that rolled to go first would have a huge advantage especially in a game of this scale. So we decided to borrow a little bit from the Kill Team game. At the start of EVERY phase (movement, psychic, shooting and assault) each team would roll off for turn order. This would go for all five game rounds! Each team would have one objective placed in each of their deployment zones (for a total of 6) and there would be one objective placed in the very middle of the map. That objective in the middle was worth 150 Victory Points at the end of the game! Central Objective: 4 VPs to the team with the CLOSEST miniature at the end of EACH FIGHTING turn. This would count for each deployment zone as well as the center objective. Slay the Warlord: 10 VPs for killing an army Warlord (1/army), +10 VPs if killed by another character, +5 VPs if killed in close combat, +25 VPs if killed by another Warlord. Character Kills: Score the PL value of a character as VP when killed. +5 VPs if it’s a named character. Titan! Guardsmen, raise your lasguns! Big Game Hunter: Score ½ the PL value of a Lord of War or Elite unit as VP when destroyed. And those were all the rules leading into this year’s battle! Next up, we’ll share a look at the 2 day long battle between the three factions!